By lookng at how an electronic circulator works, University of Texas at Austin researchers have adapted the concept and applied it to develop a non-reciprocal acoustic circulator. The device allows sound waves to travel one way and not travel back, basically a one-way road for sound. The circulator transmits these acoustic waves in one direction but block them in the other, in a linear and distortion-free way. The device is similar in concept to a one way mirror. The acoustic circulator allows one to listen but not be heard. Communications devices and radars use electronic circulators that manage transmission of microwaves and radio signals in three ports. These signals are transmitted in a sequential way from one port to the next. The unused port acts as an isolator to allow the signals to travel to the other port but not back. Using this technology, the researchers adapted it to sound waves. This development can lead to advances in noise control, sonars and sound communication systems, and components for acoustic imaging and sensing. 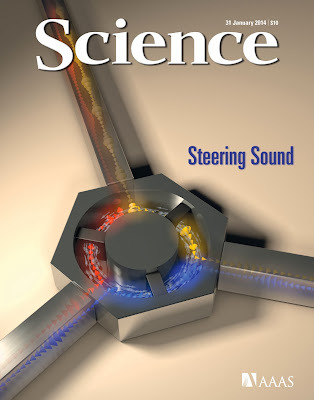 The image is the non-reciprocal acoustic circulator as shown on the cover of Science. The device creates one way communication channels for sound letting sound in but not in the opposite direction. The arrows show the acoustic signals travelling through the device albeit in a non-reciprocal manner. "It is just the right spin of fluid (air) coupled with the strong resonance of our ring cavity, which makes our design powerful," Alù said. "These two combined mechanisms create strong nonreciprocity in a compact device. Sound waves are routed in one direction only — always contrary to the direction of the airflow."